The European Poker Tour returned to the place where it all began 15 years ago with the victory of Alexander Stevic and the festival at Casino Barcelona is traditionally known as one of the biggest and busiest stops of the calendar year. It was no different for the 2018 PokerStars European Poker Tour Barcelona €5,300 Main Event, yet the expectations went up a notch higher as the tournament once again set a new record attendance thanks to 1,931 entries. A prize pool of €9,365,350 was generated and the lion's share of that was still up for grabs when the final six hopefuls returned to their seats in the Salon Gaudi. The coveted EPT trophy, seven-figure payday, and two Platinum Passes worth $30,000 for the highly anticipated 2019 PokerStars Players No Limit Hold'em Championship (PSPC) awaited. On top of that, there was also the possibility of the second two-time champion in the 15 years of the ever-popular series. John Juanda, who emerged victorious back in 2015 right here at Casino Barcelona, came close again and bowed out on the penultimate tournament day in 9th place. The 2015 Deauville champion Ognyan Dimov went even further and returned for the final day, but Dimov's run came to an end in 3rd place. Down to the last four players, a deal was cut and that left the Platinum Pass, €180,000 in cash and the elusive trophy up for grabs. 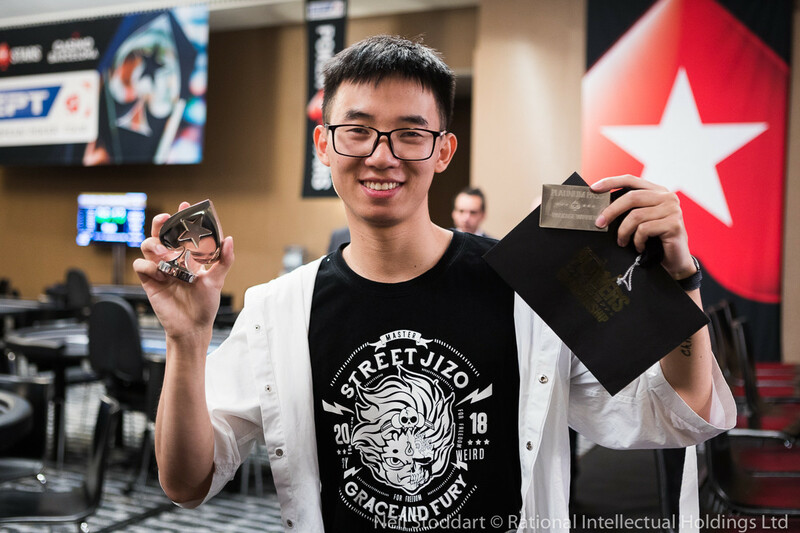 In heads-up, it was a duel between online qualifier Piotr Nurzynski and self-confessed recreational player Haoxiang Wang, who started the final day second and first in chips respectively. Since Nurzynski was also the last online qualifier standing, it automatically locked up the two Platinum Passes right there. Wang started heads-up with a commanding lead, but Nurzynski scored an early double up with pocket kings against the middle pair and straight draw of Wang before pulling into the lead soon after. Both traded chips back in forth and a crucial hand saw Nurzynski gain a commanding lead when winning a big pot with jacks versus nines. Soon after it was all over and the doctor from Poland was joined on the feature table by his fiancé. Nurzynski, who took two years off to travel and played a €250 satellite on PokerStars while in South America, only had $11,812 in live earnings to his name and takes home €1,037,109 for his efforts. “I can't believe it ... it struck me. wow. I ran really really well. I made two huge mistakes today and I was thinking I can't win it. But it's amazing, it's hard to say something now. Nurzynski already had the Platinum Pass locked up and claimed it in style with his victory. “Yeah of course I am excited,” he replied when asked about that upcoming trip to the Bahamas in January 2019. “The pressure was much lower and I think I played much better from this point,” Nurzynski said in the interview with Joe Stapleton when asked if the pressure was gone after the successful four-way deal. 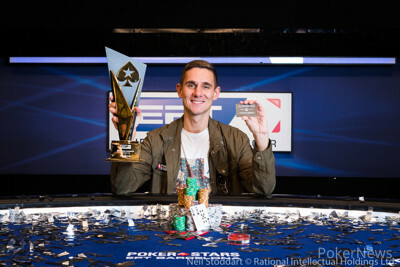 Nurzynski also joins the ranks of fellow countrymen such as Dominik Panka, Dzmitry Urbanovich and Sebastian Malec to become the fourth EPT Main Event champion from Poland. While Wang was initially disappointed to end up in second place, the seven-figure payday will ease the pain and he will meet Nurzynski in the Bahamas in a few months from now. Only six players remained and Rodrigo Carmo was the shortest stack with ten big blinds, aiming for an early double or pay jump. The Portuguese would get both as he doubled through Haoxiang Wang in the first level of the day. Wang slipped down further and lost several pots, while online qualifier Piotr Nurzynski took over the top spot. In the second level of the day, the action picked up and Matthias Tikerpe lost a flip with ace-king suited against the pocket nines of eventual champion Piotr Nurzynski. Only a few minutes later it was all over for Portugal's Rodrigo Carmo, who also lost a flip with ace-king. This time, it was Haoxiang Wang who ended up as the winner with pocket eights. The final four played until the end of the level before deal discussions were brought up when everyone returned from the break. It only took 10 minutes before they shook hands and that left €180,000, the Platinum Pass and the trophy aside for the winner. Pedro Marques became the first casualty after the deal was cut, three-bet shoving ace-trey suited into the pocket tens of Haoxiang Wang. There was no help for the Portuguese and he exited in fourth place. 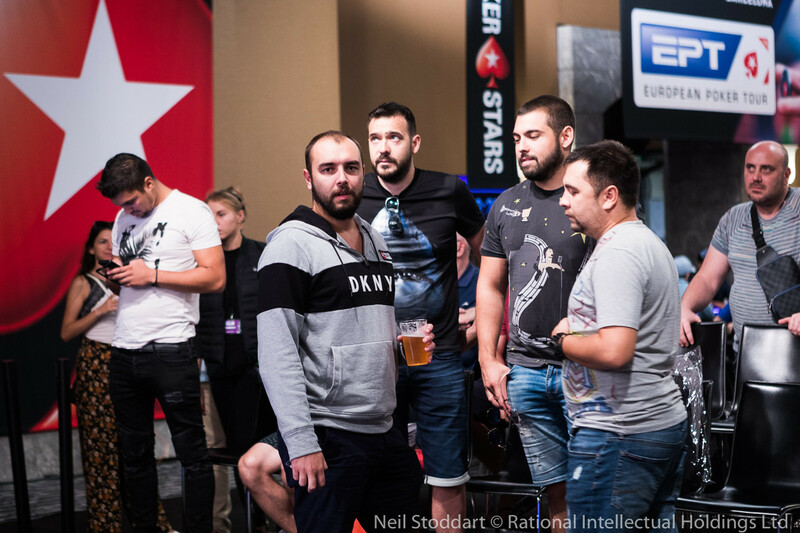 The hopes of Ognyan Dimov to become the second ever two-time EPT Main Event champion took a big hit when he lost a vital pot with ace-jack suited against the jack-seven suited of Haoxiang Wang and they clashed again soon after. Dimov moved all in from the button holding king-seven suited and Wang called in the big bling with king-eight. The board came ace-high with plenty of low cards and the kicker played to send Dimov to the rail in 3rd place. While Haoxiang Wang started with a big lead, the tides all but changed when Piotr Nurzynski jammed with pocket kings against jack-nine on a ten-nine-eight flop. Both the turn and the river were blanks and suddenly Nurzynski was back in contention and regained the lead soon after. Both were not afraid to put their chips in and the stacks were almost even when a big hand gave Nurzynski a stronghold in the duel with jacks versus nines. Wang never recovered from that setback. In fact, it only took a few hands before he check-called the turn and river of an ace-high board with king-deuce for second pair. Nurzynski had ace-nine suited for top pair and that sealed the victory. That wraps up the PokerNews coverage of the record-breaking Main Event in Barcelona and the next exciting live events are already around the corner. 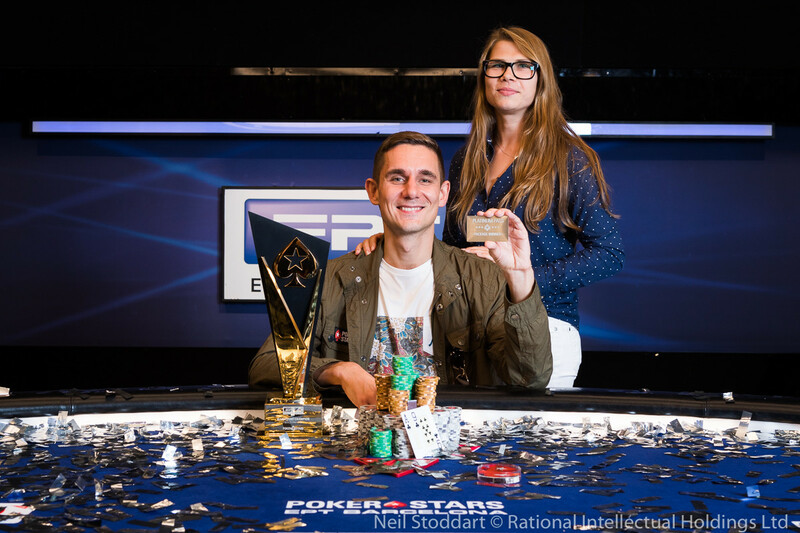 Piotr Nurzynski Wins the 2018 EPT Barcelona! Piotr Nurzynski called on the button with , and Haoxiang Wang checked his option in the big blind with . The flop came down , and both players hit a pair, but Nurzynski had the lead. Wang led with a 500,000 bet which Nurzynski called. Wang opted to check on the turn, and then called a 2m bet. The river card was the , and Wang checked once more. Nurzynski moved all in and put maximum pressure on Wang who had no time bank cards left. With just 30 seconds to make his decision, Wang was undecided, and the clock was rapidly running down. With just two seconds left to act Wang called and saw the bad news. Wang's head sank as Nurzynski stood from his chair victorious to claim the title. 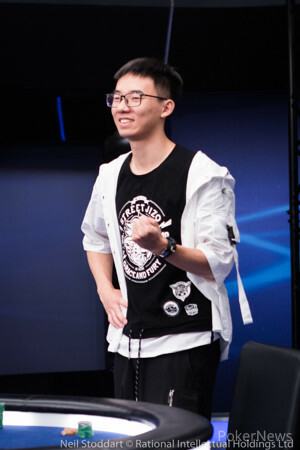 Wang departs with €1,023,701 after the four-handed deal was agreed, and a $30,000 Platinum Pass to the Bahamas after Nurzynski won the last longer competition. A full recap of the final day action will be posted later on with Nurzynski's reaction to his win in the record-breaking EPT Barcelona. Haoxiang Wang raised to 1.0 million with the and Piotr Nurzynski three-bet to 3.1 million with . Wang called and the flop fell , both players checked. On the turn, Nurzynski bet 3.5 million and Wang called. The came on the river and a pot of 13.6 million had already emerged. Nurzynski gave it some thought and bet 12 million for almost the size of the pot. Wang was sent into a world of pain, stood up from his chair and studied the board and his opponent. With one time bank left, Wang had one minute to act and called just before the shot clock ran down. Nurzynski showed his jacks and Wang mucked in disgust. Piotr Nurzynski raised to 900,000 on the button with , and Haoxiang Wang called in the big blind with . The flop fell , and Wang check-called a 700,000 bet. Both players checked on the turn, and Wang checked on the river. 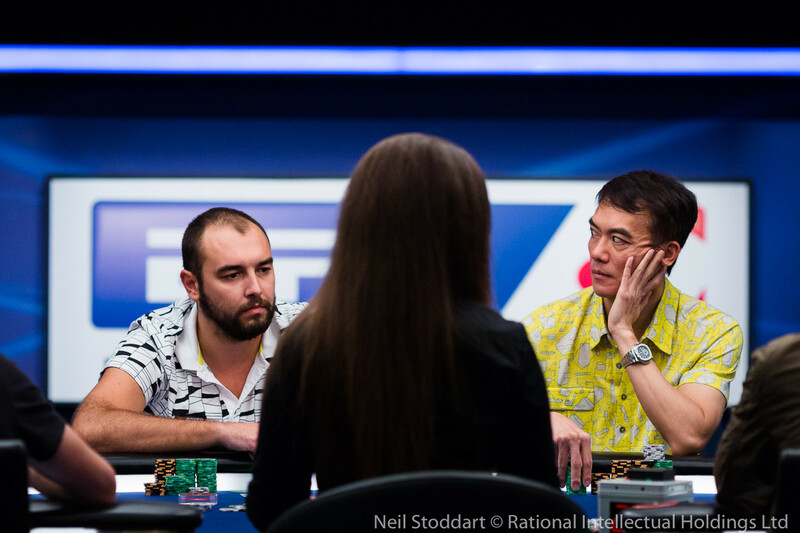 Nurzynski went for a bluff bet, and Wang decided to fold, as the stacks moved to even once more. 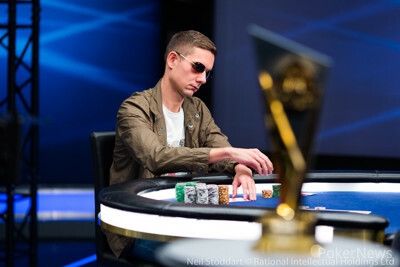 Piotr Nurzynski raised to 800,000 with the and Haoxiang Wang three-bet to 2.3 million with the . Nurzynski folded and retained his narrow lead. Nurzynski raised to 800,000 with the and Wang called with . On the , Wang check-called a bet of 700,000 and the turn paired the board. Wang now led for 1.7 million and Nurzynski called. 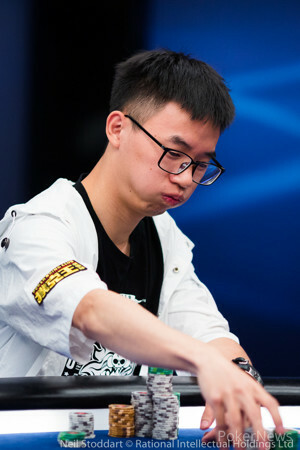 The came on the river and Wang fired a second bet of 3.8 million. Nurzynski elected to fold the best hand and Wang claimed the pot. Soon after, the turn showed and Wang bet with , Nurzynski called with . The fell on the river and Wang bet 3.4 million into a pot of 4.0 million. Nurzynski counted out the chips for a call and folded. Piotr Nurzynski called on the button before Haoxiang Wang raised to 900,000 from the big blind with , which Nurzynski called. The flop gave Nurzynski top set, and he called a 700,000 bet. The turn card was the , and Wang bet again, this time close to pot, for 3.1m. Nurzynski called after using a time bank card, and when the river came the , Wang checked. Nurzynski bet for value for Wang was in no position to call and sacrificed the pot. Haoxiang Wang raised it up with the and Piotr Nurzynski called with . They checked the flop and the turn. Nurzynski also checked the river and Wang now bet 1.1 million into a pot of 2.2 million. Nurzynski gave it some thought and paid off, and Wang reclaimed the lead.